Wedged Between Buildings, Plane Part Could Be From Sept. 11 : The Two-Way New York police say the debris appears to be from one of the planes that hit the World Trade Center in the 2001 attacks. Surveyors found the piece of landing gear during an inspection just a few blocks from ground zero. 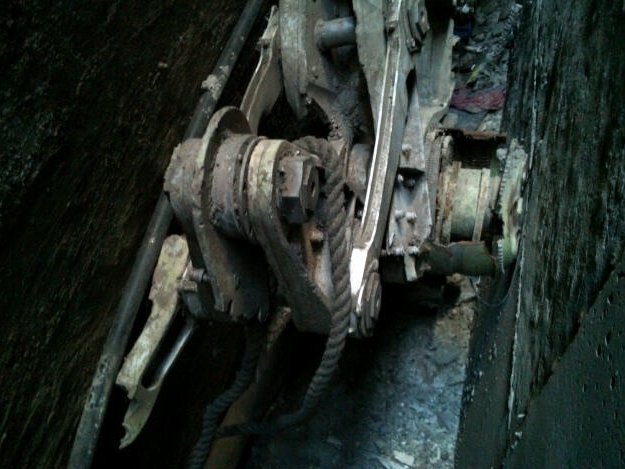 A piece of commercial landing gear was found between two buildings in lower Manhattan. Surveyors have found what appears to be part of a plane that hit the World Trade Center towers on Sept. 11, 2001, New York police say. The piece of landing gear is about 3 feet wide and 1.5 feet deep, police tell The Associated Press. In a statement, NYPD Deputy Commissioner Paul Browne said the debris was found wedged between two buildings during an inspection at the site of a long-planned Islamic community center. NPR's Margot Adler tells our Newscast Desk that 51 Park Place, just a few blocks from ground zero, already houses a mosque. "Sharif El-Gamal, the owner of the building, says they are cooperating fully with authorities to make sure this piece is removed with care," she says. The medical examiner is evaluating the site to determine whether they need to sift the soil "for possible human remains," Browne said. The deputy commissioner said NYPD "is securing the location as it would a crime scene, documenting it photographically and restricting access." Browne said the equipment won't be removed "until the process is completed." "Other debris, including human remains, has been found scattered outside the site, including on a rooftop and in a manhole, in years since."